due to the lack and age of the training assets in the region. In recognition of this need, these leaders began to envision a Joint Regional Trainin Facility in order to pool regional resources and deliver practical, efficient, and cost effective training at a world class facility built on a budget. Not only did these leaders want to pool resources they wanted to create an environment to foster regional cooperation amongst the services. 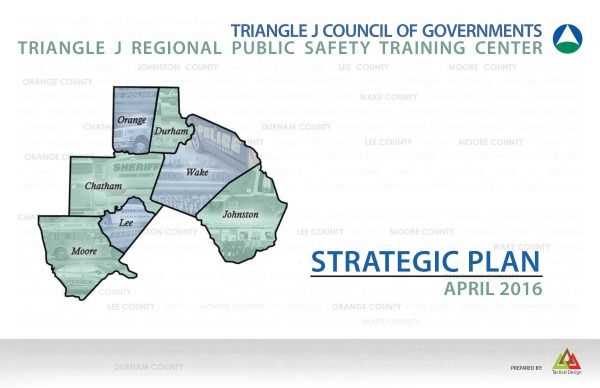 To ensure any public funds would be spent wisely these individuals began talking to organizations across the Triangle J region to gain a consensus as to what facilities are needed and enlisted Tactical Design to conduct a Needs and Strategic Plan for the facility. Furthering the initial effort a training and facility needs assessment workshop was conducted by Tactical Design North, with invitations to as many Regional Service Providers and Organizations as possible, in order to identify and quantify what is needed. This multi-day exercise was widely attended and resulted in an extensive amount of data and a thorough definition as to what is needed in the region. 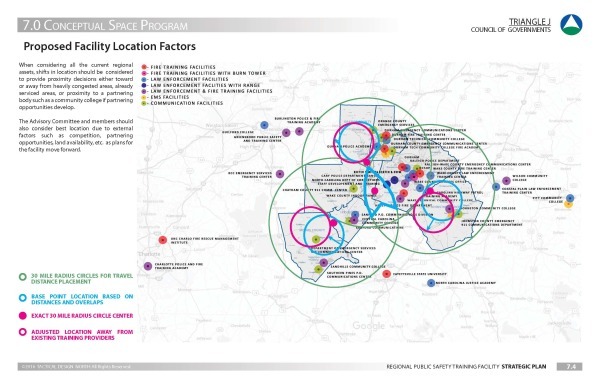 As a part of this Needs Assessment and Strategic plan, a conceptual site masterplan was created with site selection criteria to help find a site for the facility.